It was the day of great disappointed for Elizabeta SAMARA. At the edge of tears she concluded the opening day of the DHS 2014 Europe Cup in Lausanne with two defeats against LIU Jia of Austria and Petrissa SOLJA of Germany. Generally it was bad day for Romania. Daniela DODEAN MONTEIRO also failed to post a victory. She lost against Czechs Iveta VACENOVSKA and LI Jiao of Netherlands. However, we found them on very opposite positions on mood scale. SAMARA was tired and sad, whilst Daniela was full of optimism. “I am so tired. From the beginning of the year all I can remember are airports and planes. I went from one to another event. I need a rest. I need to dedicate serious time to my training. I need to get back in shape. Most of all I need to go home,” said Elizabeta. 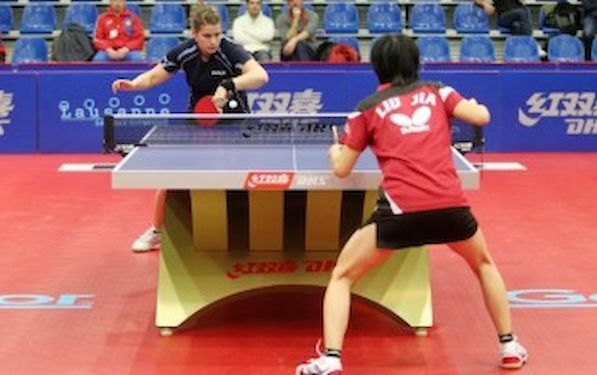 Top seeded LI Jiao posted two victories, but face great challenge against VACENOVSKA. Player from Czech Republic stretched her to full distance. Just like LI Jiao, Viktoria PAVLOVICH of Belarus was the creator of her own fate. With two victories over WU Jiaduo of Germany and Rachel MORET of Switzerland, she could wait for the epilog of the Groups stage without any fear. At the ened it was WU who secured quarterfinal as a second in the Group. LIU Jia beat Petrissa SOLJA to join them. Petrissa also progressed to the next stage. Group 4 was lethal for another seed. HU Melek lost against Margaryta PESOTSKA, but needed full five games to beat Georgina POTA. POTA succeeded against Ukraine’s player, so they both booked quarterfinal place.